Huntington Beach resident Bobby Waltman, 29, right, holds onto his Chihuahua mix, Mooshy. Waltman is a lawyer living with his mother, Nasrin Waltman, left, and his grandmother. He passed the bar in December and is currently an associate attorney at a personal injury firm, however, he’s faced financial difficulty due to his $85,000 in prelaw and law school loans. Burdened by $85,000 in college debt, attorney Bobby Waltman lives with his mom and grandmother in a three-bedroom house in Huntington Beach, Calif.
Past frugality led the 29-year-old to live in a van parked at the beach, a one-room casita behind a Santa Ana, Calif., house and a tent in Alaska. Now, he’s counting the days until his finances are sound enough to afford a home of his own. Waltman may be symptomatic of a problem that’s still plaguing the housing market – and, to some extent, the economy as a whole. The recession forced millions to move in with parents and relatives, or delay leaving, and to double up with roommates. Not only did those people put off buying or renting homes of their own, but the impact has rippled through the economy in the form of reduced demand for furnishings, appliances and home and garden supplies. Although job growth has returned and the housing market has turned a corner, some economists worry that not enough young people are leaving the nest. Whether it’s because of student loans, credit card debt, a foreclosure hangover or a need to save for a mortgage, “household formation” has yet to get anywhere near pre-recession levels. At a time when investors are buying fewer homes, the slow pace of household formation means fewer first-time buyers taking up that slack, which could limit the housing market going forward. “Low household formation during the recession meant weaker demand for housing, which held back construction,” said Jed Kolko, Trulia’s chief economist. Figures from the U.S. Census Bureau highlight the problem. While the nation averaged nearly 1.2 million new households a year in the past five decades, that number fell to about 650,000 annually in the past five years, census figures show. Last year, 160,000 new households were created. “During this past recession, household formation really got affected negatively because some of these kids lost their jobs and moved back with their parents, or they coupled up,” said Chapman University economist Esmael Adibi. But Adibi noted that some people – like his neighbor’s 26- and 29-year-old children – still are living with their parents long after getting rehired. Economists note that demographics and migration also affect household formation rates. Tim and Jenny Haagen spent 2 1/2 years living in Jenny’s old bedroom at her parents’ home in Anaheim Hills, Calif., after they both lost their jobs in May 2010. Jenny, 32, an elementary school teacher, soon found work as director of student resources at Brandon University, but at a pay cut. Tim found a new job within six months. Still, they continued to live with Jenny’s parents for two more years. The arrangement made it possible for the pair to get married in Maui in June 2011. 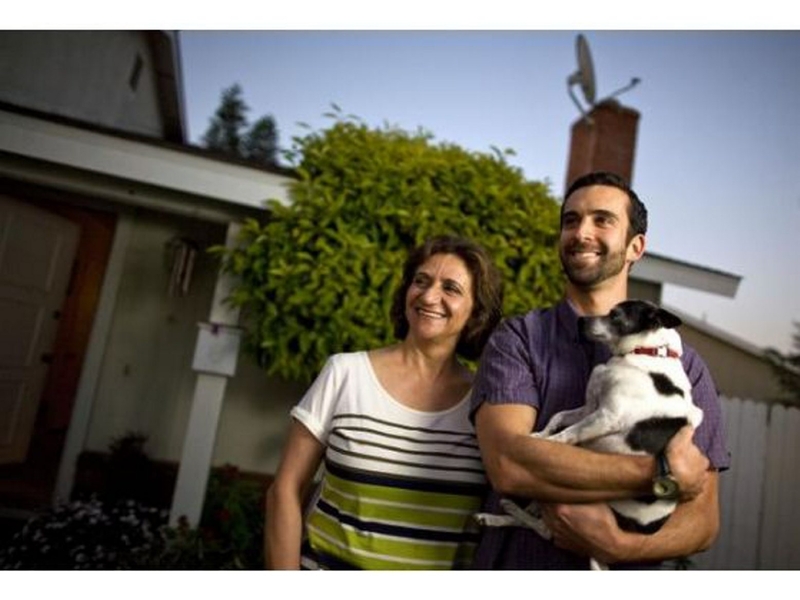 In January 2013, they closed escrow on a three-bedroom, two-level condo in Tustin, Calif. They expect to have their first baby in August. A National Association of Home Builders study released last month found that the share of 25- to 34-year-olds living with their parents increased to 19 percent in 2012, from around 12 percent in 1990 through 2005. When household formation picks up, Kolko told the Orange County Register, many of these new households will be young adults moving out of their parents’ homes or roommate situations.